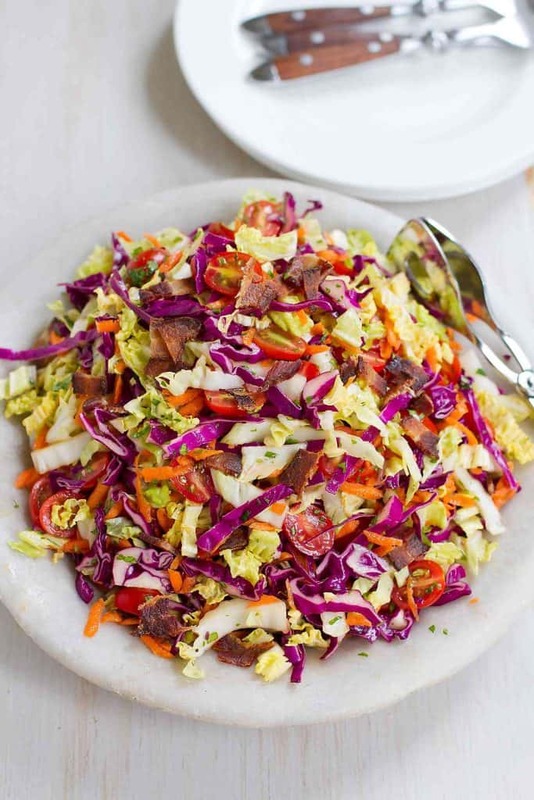 Once you taste this healthy BLT Slaw recipe, you’ll want to make it for every summertime potluck and barbecue! Plus, it’s a breeze to make. There are some recipes that swoop into your life like a super hero streaking towards a hapless victim. 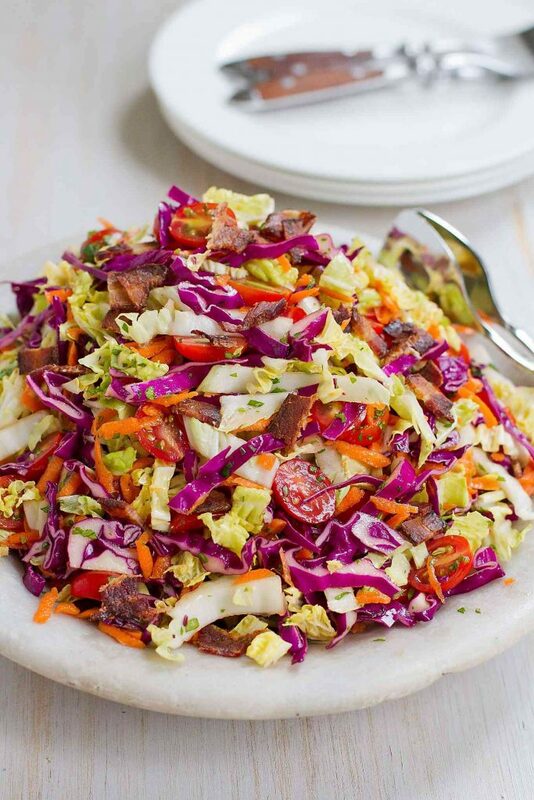 That’s a lot of pressure to put on a salad, but this BLT slaw recipe saved my behind when I was in a pinch last week. We were invited to the first “come one, come all” potluck barbecue in our new neighborhood, but it conflicted with one of my son’s last soccer games of the high school season. Not to mention the fact that I had a fever, a nasty cough and a sore throat. Good times. The last thing I wanted to do was show up late, then infect all of our new neighbors (not in the “how to make friends” handbook), so we declined the invitation. On the day of the barbecue, our new friends up the street invited my younger son to join in the fun, even though the rest of us couldn’t. He could hang out with the other kids and be fed by the neighborhood village. To him, watching ANOTHER one of his brother’s seemingly endless soccer games felt like a death sentence (the drama! ), so he was thrilled! I was determined not to be that neighbor who sent their kid to the party empty-handed and ready to eat everyone else’s food. The fever and coughing was in full swing and the thought of running to the store for even a container of store-bought cookies sounded hideous. So, I rummaged through the fridge and managed to find some cabbage, tomatoes, carrots, bacon and some limes. And so this BLT slaw was born. I put myself on autopilot, prepping enough cabbage, carrots and tomatoes to fill a bowl. I threw in some cilantro, cooked and crumbled some bacon and made a 30-second honey lime dressing. Salad done. Neighborly relations intact. This salad is so easy and delicious that it has earned a place as my new summertime potluck go-to recipe. If you want to make the salad earlier in the day, combine all of the chopped veggies, whisk together the dressing and cook the bacon. Toss everything together just before serving. Place the bacon slices in a single layer in a large nonstick skillet set over medium heat. Turn until browned and crispy. Transfer to a paper towel to drain. Dispose of any grease from the skillet. Once cool enough to handle, crumble the bacon. 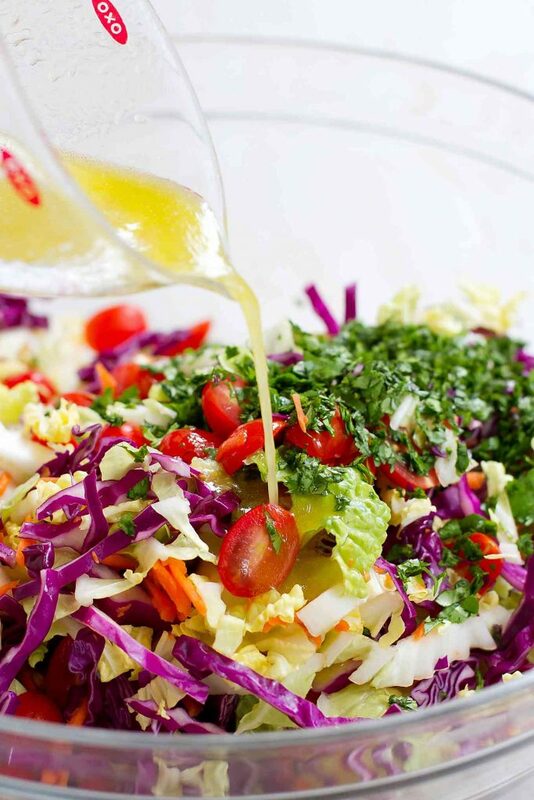 In a large bowl, combine the Napa cabbage, red cabbage, carrot, cilantro and tomatoes. Toss with the dressing. Serve. In a small bowl, whisk together the lime juice, olive oil, agave nectar and salt. I love slaw but I never thought to include bacon! What a great idea, can’t wait to try it! Such a perfect side dish for the summer! I would totally devour this with some brisket! Hi Judy, thanks for your concern. I’m not quite sure why you’re assuming I didn’t do any of those things. I have no interest in making my family or neighbors sick. This is sp pretty! Such a perfect side for any meal!! What a great twist on traditional cole slaw! 🙂 This just might be making an appearance at my son’s graduation cookout in a couple of weeks. Looks amazing! Do you know how leftovers hold up? Hi Elizabeth, like most salads, it becomes a bit limp by the next day, and the bacon loses its crispness. If you feel like the portion is too big for your needs, I would suggest either cutting the recipe in half or just dressing part of the salad. The rest can be dressed the next day. I hope that helps!